The config is very simple. Editing the sounds is also a breeze. Some sounds are quite original (aqua, sitar etc. ...), if not generally have the effect of average quality. Tinkering a little bit we get to do stuff really cool anyway! it is effective is very thorough, a good tool for any day. 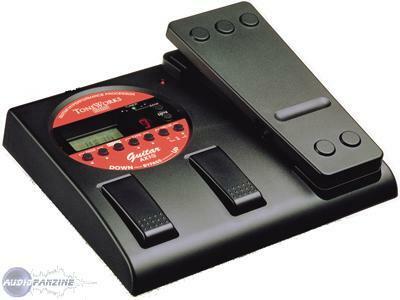 can connect a headset to operate with batteries, there is even a built-in metronome. I used it for 2 years and I enjoyed myself with. it remains a multi effeetive to begin or for the guitarist who needs a comprehensive multi-purpose for work and can be taken anywhere without fear. It is no longer used but for a 50n euros it's still a good investment. The unit is very lightweight and portable (backpack ,...). But because of its light weight (especially used without batteries) must be wary of his next player on stage. The effects are placed "in the chain" in a conventional manner in the three banks (identified by a 3-color LED practice in the dark). Selection effects in the chain has a drawback is that it must adapt to the serial structure of the piece (for example, we can not get the sound "3" directly from the "6": it must come down and go through the effects "5" and "4" ... but it's a problem on a large number of cranks. At the sound editing menus are clear adze, is made to run the types of settings page (drive, tone, amb, pedal, nr, etc ...) so it is relatively intuitive. Personally, I quickly put away the manual handling is so simple. The quality of the effects is not extraordinary, but the ability to act fairly thinly over all the settings can achieve something good if we take into account the possibilities of this little device. The expression pedal can act on aTitle presets, we can choose to switch or not an effect. Be careful when using the pedal, some effects are no longer available. Its compact side and level opportunities for entry-level model is really what I prefer. Meanwhile, it has the defects of its advantages: it is light enough, so too must not shoot with his jack! The optical plastic pedal is quite fragile (it has split from Elsewhere on its width). It is therefore not very suitable for the stage. Before buying it 3 years ago, I tried the zoom 505 and 707, but it had seemed to offer so many possibilities, and a lower price (purchased 800 F OCCAZ at the time). I think if I had to jump back, I do the same or I would buy the Boss ME 30 is a somewhat similar and has the advantage of having several switch.